There is a GAA (Gaelic Athletic Association) club in almost every parish in Ireland, and in each county teams are drawn from these clubs to contest the annual All Ireland Championships in Football and Hurling, the biggest competitions of the GAA year. Both football and hurling are completely amateur sports and very rooted in the community. The structure of the sport is built around parishes, with almost every parish in Ireland having its own club, teams, grounds and clubhouse, which are a real focus for community activity. Within each county clubs compete fiercely at various levels for the county title. The winning club teams then go on to compete with winning clubs from other counties for the hotly contested national club title. However at county level the best players put their club allegiances temporarily to one side and come together to play for their county in the All Ireland Championships. These competitions – for both football and hurling – are easily the biggest events in the Irish sporting calendar. Some counties are traditionally stronger in hurling, others in football. 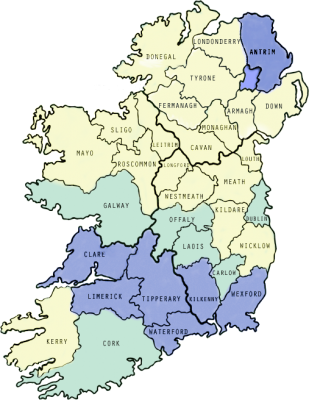 The map shows counties where hurling predominates in blue, where football is strongest in yellow and where both games are strong in green. County teams are avidly supported, players are local heroes always, national heroes often, and tens of thousands regularly attend games. When Irish people speak wistfully of ‘September’, they are thinking not of autumn leaves but of the All Ireland Finals, and hoping they’ll have reason to travel to Dublin to support their county team. By the time the competitions reach the semi-final and final stages tickets for matches are like gold dust and will be sold out weeks in advance. And yet the players, names and faces faces famous now all over the country who have gone onto a pitch in front of 80,000+ people and been seen on television by countless thousands more, get up and go to work the next week and tog out for their local team in the next county level game. There is something very special about that, and it’s what makes the GAA unique. Traditionally the home of GAA, this stadium close to the centre of Dublin was redeveloped in four phases between 1993 and 2005 and is now a world-class stadium with capacity for more than 80,000 fans. While wholly owned by the GAA, and generally only used for GAA games, it played host to both soccer and rugby games while the home stadium for these sports at Landsdowne Rd was being rebuilt in the early 2000s. 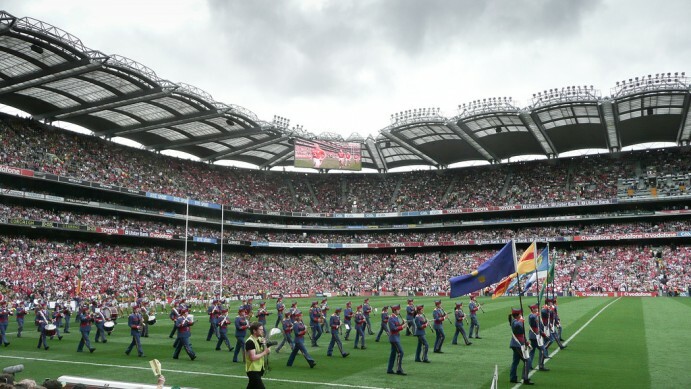 While this may not sound like a big deal, it was, since for decades not only were GAA players banned from playing those ‘foreign games’, they could even be expelled from the GAA for attending rugby or soccer matches as a spectator. It is also a popular venue for concerts. There is a museum of GAA, with tours of the stadium, at the Croke Park visitor centre, which makes an interesting few hours for any avid sports fan. Each county has its colours, which will be used in players’ jerseys and seen in flags flying all over the county – especially in years where the county is doing well and has reached the latter stages of the Championships. You are bound to see some of these flags flying from flagpoles, trees, windows and on cars as you travel around Ireland, particularly in late summer as the finals, which are held in September each year, draw closer. Most counties also have nicknames, by which the county, the inhabitants of the county and the team are known. They also often have a song, which fans sing loudly to urge their side on, and even more loudly if they win!! This is a list of the various colours, county names or nicknames and the songs for each county of Ireland. For Cork: “The Blood and Bandage” and “In Around the House”.